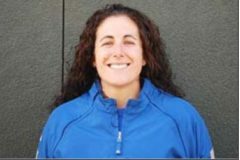 It was perhaps fitting that the 400th softball victory by College of San Mateo softball coach Nicole Borg and her staff — 6-4 over host Ohlone College — also gave the state top-ranked Lady Bulldogs a game and a half lead over the rival Renegades in the Coast North Conference. Borg and assistants Toby Garza and Dale Bassman reached the milestone in their 12th season together directing the CSM program, which has reached the California Community College Athletic Association Final Four tournament each of the past five seasons. The overall record is 400 wins and just 122 losses. This entry was posted on Wednesday, April 25th, 2018 and is filed under Athletics, Awards, Headline, Softball. You can follow any responses to this entry through RSS 2.0. You can leave a response, or trackback from your own site.